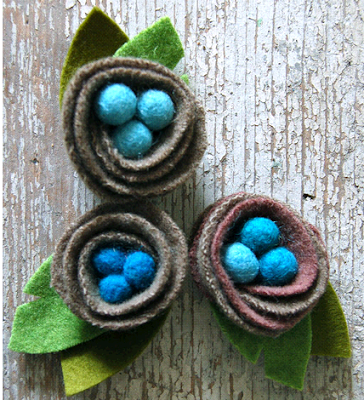 Aren't these springtime nest brooches gorgeous? The picture is from the book Sewing Green: 25 Projects Made With Repurposed & Organic Materials by Betx White, courtesy of the purl bee. I love the blue of the eggs. 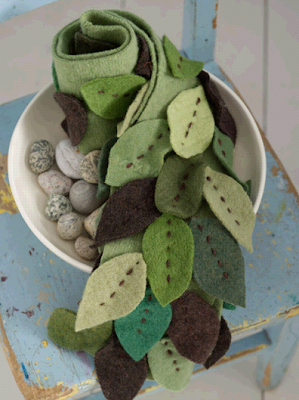 The author is offering a workshop on how to make the nests at Purl Patchwork. I got all excited when I read about the workshop, clicking on the link in hope it might be within a 50 mile radius of my home. Turns out it's in New York, which is slightly more than 50 miles away (more like 6,000 miles). 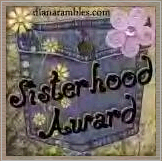 I've been putting off mentioning the exciting news that I received a Sisterhood Award from Rachel over at Not-So-Plain Jane a couple weeks ago. I am very, very happy to have received it, but I haven't posted about it because I have mixed feelings about the custom of passing it on to at least ten more bloggers. I'm hesitant to pass it on for various reasons. Since Rachel offered this award with no strings, I'll just say that if you're on my blogroll, I read your blog faithfully because I like and admire you or your work or your writing or all three. And I hereby offer you this prestigious award! Feel free to grab it. And if you don't want to take it, you're welcome to come back and visit it any time. I'm hooked on taking walks with my camera to photograph flowers. I love how it makes me slow down and really absorb the vividness and the contrast of color. I'm finding myself looking at nature with new eyes, seeing the play of shadow and light that might have gone unnoticed in the past. Here is my little painting from yesterday after I freshened it up with my new paints. I mentioned in another post these canvas's are 1.5" X 1.5", but it turns out they are 2" X 2". And here is my second attempt at painting a picture. I sealed it in Modge Podge, which makes it difficult to photograph because of the sheen, but I like using a sealer because once it's applied, I have to move on and can't mess with it anymore. It's fun painting without really knowing what I'm doing because I have no expectation that my picture will be spectacular. If trees and clouds and mountains look vaguely like trees and clouds and mountains, I'm happy. Congratulations on your award! Those flowers are beautiful, and how fun that you're taking the time to make your pretty little paintings!